A beautiful example of Rigobert Bonne's 1771 decorative map of the lands of the Bible's New Testament. Covers from Italy eastward to include the Eastern Mediterranean, parts of Africa, Egypt, Persia, Arabia and Asia Minor. 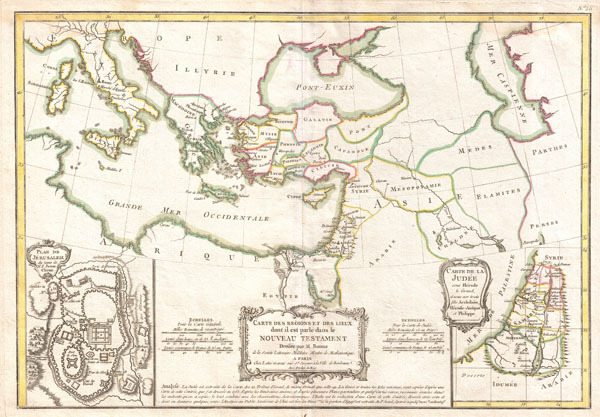 Includes both the Blank Sea (Pont-Euxin) and the Caspian Sea (Mer Caspienne). Numerous Biblical sites noted throughout. An inset in the lower left quadrant details the city of Jerusalem in the times of Jesus Christ. Notes the Temple, the Fort of Sion, and the Palace of Solomon, the Mount of Olives, etc. A second inset in the lower right quadrant focuses on Judea under the Biblical King Herod. A decorative baroque title cartouche appears at the bottom center. Drawn by R. Bonne in 1771 for issue as plate no. A 20 in Jean Lattre's 1776 issue of the Atlas Moderne. Very good condition. Original centerfold exhibits light toning. Blank on verso. Rumsey 2612.084. Phillips (Atlases) 664. National Maritime Museum, 215. British Libarary (World), col. 384-385 (1762-1785 eds. ).